Attorney-client privilege. When working with a licensed disability attorney, applicants enjoy attorney-client privilege. Your attorney is required to keep all of your information personal and confidential. Strict ethical guidelines. Attorneys are required to abide by strict ethical guidelines when representing their clients. Easier appeal process. If your application for SS or SSI benefits is denied, a disability attorney can help you appeal that decision to the federal district court. Non-attorney disability advocates are unable to do this. Option to file a grievance. Should you have a problem with your disability attorney, you have the option of filing a grievance with the state bar regulatory commission; you do not have the same recourse when working with a non-attorney disability advocate. Also, while disability attorneys and non-attorney disability advocates receive the same fee—paid by the SSA out of an applicant's back payment benefits—a non-attorney disability advocate does not have to meet the same educational requirements as a lawyer. While disability attorneys are required to have a four-year bachelor's degree, a three-year juris doctorate degree, and pass the exacting state bar exam, non-attorney disability advocates are only required to have a bachelor's degree or equivalent work experience, pass a criminal background check, have liability insurance, and complete a written exam. For the same price, you can work with someone with much more impressive credentials. Do You Need Help Applying for Social Security Benefits? The knowledgeable legal team at Keefe Disability Law has extensive experience helping applicants apply for and obtain the SS Disability benefits they need and deserve. Contact our office today for a free case evaluation or to request a free copy of the book, The Five Most Frequently Asked Questions About Social Security Disability. Should I Hire a Disability Attorney? Will my wife’s income affect my Social Security disability claim? No, because Social Security (SS) Disability is not based on income, so your wife's income will not be considered by the Social Security Administration (SSA) when reviewing your claim. Instead, the SSA will determine your eligibility for SS benefits based on the severity of your disability, its expected duration, and whether it prevents you from holding a job and engaging in substantial gainful activity (SGA). So, if your medical condition has rendered you totally disabled and unable to work for a period of 12 consecutive months or more, you may qualify for SS benefits, even if your wife continues to work and make a good income. 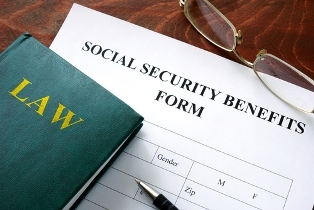 However, this is not the case when applying for Supplemental Security Income (SSI) benefits. Because SSI is a needs-based program for disabled individuals with low income, a wife's income is used when determining eligibility. If you were applying for SSI and your wife's income exceeded a certain amount, the SSA would consider a portion of that income available to you. 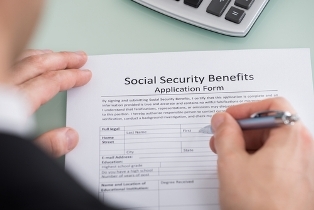 Applying for SS benefits can be tricky for those who are unfamiliar with the SSA's application process—particularly if you're applying for a condition that's not included in the “Blue Book” Listing of Impairments. Even a minor mistake can cause frustrating delays or application denials that require you to wait even longer for the financial benefits you so desperately need. A seasoned team of knowledgeable disability attorneys can help make sure that your application is complete and ready to go before you send it in. And in the event that your claim is denied, your legal representative can go to work to help overturn that decision. Contact the skilled attorneys at Keefe Disability Law today for a free evaluation of your SS claim, or request a free copy of our book, The Five Most Frequently Asked Questions About Social Security Disability. 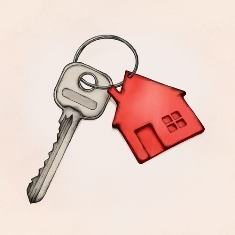 Does owning a home make me ineligible to receive SS benefits? No. If you are applying for Social Security (SS) disability benefits, owning a home will not negatively affect your eligibility for benefits. This is because the Social Security Administration (SSA) determines an applicant's eligibility based on the severity of his medical condition and ability to work, rather than any assets or resources he may have in his name. This means that it is possible for applicants to qualify for SS benefits even if they own multiple homes or vehicles, provided they meet the SSA's medical criteria for total disability. However, the same cannot be said for Supplemental Security Income (SSI), the other disability-related program administered by the SSA. This needs-based program is only available to low-income applicants with limited assets and resources. The SSA currently caps the assets for SSI applicants at $2,000 for an individual or $3,000 for a couple, but not all assets are counted toward this limit. For example, the home you live in and the vehicle you use for regular transportation may be exempted, making it possible for some applicants to qualify for SSI even if they own their home or have their own vehicle. In select instances known as concurrent disability claims, applicants may be eligible to receive both SS disability and SSI benefits, provided they meet the criteria for both programs. Do You Need Help Applying for SS or SSI? The SSA uses very specific criteria to determine SS and SSI eligibility, and applicants must include detailed medical information when applying. If this information is not included, the application may be rejected. Don't allow a small mistake or oversight to delay the approval of your benefits. Contact the experienced legal team at Keefe Disability Law for a free case evaluation or to request a free copy of the book, The Five Most Frequently Asked Questions About Social Security Disability. Our knowledgeable attorneys understand the disability application process and are ready to help you every step of the way. Do All Disabilities Qualify for Social Security Benefits? Having a disability doesn't automatically mean that a person is eligible for Social Security (SS) disability benefits. This is because the Social Security Administration (SSA) determines disability based on a person's ability to work and doesn’t view having a disability the same as being totally disabled. 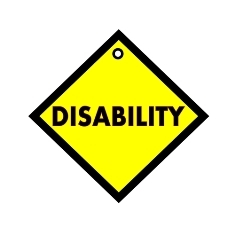 To meet the SSA's definition of total disability, a person must be unable to do the type of work he did prior to the disability and be unable to adjust to other types of work due to the severity of his medical condition. The disability in question must also be expected to last for a year or longer, or result in death. In most cases, SS applications submitted by people who are working full time will not be approved. Even working part time can hurt your chances for receiving SS benefits if the SSA determines you're capable of substantial gainful activity (SGA)—work that involves significant physical or mental activity, or a combination of the two. The SSA uses a dollar amount to determine SGA, so people who work full- or part-time hours but whose gross earnings average less than $1,130 per month may still be eligible for benefits. A higher SGA threshold of $1,820 applies to blind applicants. If you're disabled, there are two ways to secure SS benefits. The first is by having a disability on the SSA's list of “Blue Book” conditions—these disabilities are considered severe enough to automatically qualify an applicant for benefits. The second is by proving that your condition prevents you from working—even if you don't have one of the qualifying, disabling conditions listed by the SSA. Applying for SS benefits can be a complex and lengthy process. Having a knowledgeable disability attorney by your side to help guide you through each step of the journey can be invaluable. An attorney who knows the specific SS process may increase the likelihood of your application being approved and help you if your application is denied. Contact the experienced attorneys at Keefe Disability Law for a free case evaluation or to request a free copy of the book, "Seven Costly Mistakes That Can Ruin Your Social Security Disability Claim." I was diagnosed with soft tissue sarcoma, can I qualify for disability benefits? After a diagnosis of soft tissue sarcoma, you may find it difficult or impossible to hold a job. Soft tissue sarcoma is a type of cancer that originates in the soft tissues of the body. These soft tissues may include the muscles, tendons, fat, lymph vessels, blood vessels, nerves, and tissue surrounding joints. The resulting tumors can be found in many areas, including the arms, legs, chest, or abdomen. Unfortunately, many people suffering from this condition do not have signs or symptoms until the disease has already progressed. Rhabdomyosarcoma. This is the most common type of soft tissue sarcoma, often diagnosed in children. It originates in muscles that attach to bones. Gastrointestinal stromal tumors. This type of soft tissue sarcoma forms in soft tissues of the gastrointestinal tract. It is most often seen in the stomach or small intestine and effects adults much more frequently than children. Unfortunately, this type of soft tissue sarcoma may not have any early symptoms. Ewing sarcoma. These tumors are more commonly formed in the bones of children and adolescents, but may also form in the soft tissue surrounding bone. Kaposi sarcoma. Lesions made of cancer cells grow in the skin, lymph nodes, or lining of the mouth, nose, or throat in this type of soft tissue sarcoma. It is most common in people with weakened immune systems. Uterine sarcoma. Forming in the muscle and tissue that support the uterus, this is an uncommon form of uterine cancer. Regardless of the type, if you have soft tissue sarcoma you may potentially qualify for Social Security disability benefits. These benefits can provide a badly needed financial lifeline as you focus your time and energy on fighting the disease. You are diagnosed with soft tissue sarcoma in an early stage but can demonstrate an inability to work as a result of your condition. You are diagnosed with soft tissue sarcoma that has metastasized, or spread, and meets the eligibility requirements of the Social Security Administration’s Listing of Impairments. You are diagnosed with soft tissue sarcoma for the second time, having first been diagnosed and then having had the condition return after your initial treatment. In addition, if your soft tissue sarcoma is metastatic or recurrent, it may qualify you for a rapid review under the Social Security Administration’s Compassionate Allowances program. This means that your claim will likely be reviewed and either approved or denied within a few weeks of submitting your application. A diagnosis of soft tissue sarcoma. A medical history that shows the cancer is persistent or recurrent following initial treatment. A clinical history report that details the features of your disease. Results from imaging test results that document the tumor locations and sizes. A copy of the notes from your surgical procedures. Patients with soft tissue sarcoma may need to undergo surgical resections, exploratory surgeries, or biopsies. Results from pathology reports that verify your diagnosis. Results from pathology reports that stage your tumors. Applying for disability benefits is not an easy process for those who have been through this experience in the past. Fortunately, we are here to help you navigate. We encourage you to contact us today for a free consultation at 888-904-6847. Can I obtain Social Security disability benefits if I have scoliosis? If you suffer from scoliosis, you may find yourself suffering on a daily basis from pain and other discomfort that makes it difficult to carry out everyday tasks, including the ability to work to support yourself. This can create significant stress and strain not only on yourself, but also on your loved ones. It is important to focus on getting healthy rather than worrying about financial pressures. Fortunately, Social Security disability benefits can provide sufferers of scoliosis with the support they need. Congenital scoliosis. This type of scoliosis exists when the spinal curvature is present at birth. Idiopathic scoliosis. This type of scoliosis is the most common form, and is generally thought to be hereditary. Degenerative scoliosis. This type of scoliosis occurs after a bone collapse caused by a traumatic injury. It can also be caused by osteoporosis or develop after a major back surgery. Neuromuscular scoliosis. This type of scoliosis stems from nerve or muscle abnormalities. It is often accompanied by conditions affecting the neuromuscular junction, such as spina bifida. Some people suffering from scoliosis may be eligible for Social Security disability benefits. Why do People With Scoliosis Need Disability Benefits? While some people experience only minor effects as a result of their scoliosis, others who have a more severe case may find it difficult or impossible to work. Severe scoliosis can lead to significant physical limitations, including reduced lung capacity and breathing function. The curvature of the spine may put pressure on the nerves that results in slower functioning. Sufferers may deal with persistent pain as well as spinal and nerve damage. In the most severe cases, patients may need spinal surgery to insert metal poles in the spine to straighten it out. The effects of severe scoliosis can make it impossible to work, leading to significant financial strain for sufferers and their families. Fortunately for people with scoliosis, the Social Security Administration does recognize the condition among its listing of impairments. Scoliosis itself does not have its own listing. However, if the condition is severe enough, victims may meet the requirements for the listing of “disorders of the spine.” In addition, people with severe scoliosis that affects the ability to breathe or the functioning of the heart may qualify for disability benefits under the listings for respiratory disorders or cardiovascular disorders. In addition, there are certain criteria for nerve root compression, inflammation of the membrane surrounding the spine, and narrowing the spine that must be met as well. Results from medical imaging tests, such as x-rays, MRIs, and CAT scans. Results from a physical examination including a detailed description of your limitations caused by the spinal condition. Records of ongoing treatment that shows that the impairment is not improving despite undergoing therapy to try and treat it. While applying for disability benefits may feel like an overwhelming process for those who have not done so in the past, it is important to get started quickly. The faster you start the application process, the quicker you will begin to receive Social Security disability benefits. We encourage you to contact us today for a free consultation at 888-904-6847. Can complications from borderline personality disorder qualify me for disability benefits? When you suffer from a mental illness that is characterized by emotional instability and significant changes in personality over short periods of time, you may have borderline personality disorder. This condition has many potential complications that can make earning a living very difficult. Qualifying for Social Security disability benefits may be the only way to alleviate the financial burden that comes along with this condition. In addition, borderline personality disorder is often accompanied by other mental illnesses, including depression, anxiety disorders, eating disorders, and bipolar disorders. These complications can make it very difficult to find and hold a job. In order to qualify for disability benefits, you must either meet the Social Security Administration’s blue book listing for an impairment, or you must show that you are unable to do any job. The blue book does have a specific listing for personality disorders. In addition, you must provide sufficient medical evidence of your specific symptoms as well as your diagnosis. Proving your disability based on a mental condition is not always easy. We are here to help you navigate the Social Security disability benefits process. We encourage you to contact us today for a free consultation at 888-904-6847. What types of functional limitations must I show in order to get disability benefits for my somatoform disorder? Few things are as frightening as living with pain or other physical symptoms that have no discernable cause and cannot be adequately treated or cured. Unfortunately, people suffering from somatoform disorders must live with this reality on a daily basis. The good news, however, is that the Social Security Administration recognizes somatoform disorders as an impairment. This means that victims may be eligible for disability benefits as a result of their condition. You are severely restricted in the things that you do every day. For example, you may be unable to go to the store or drive a car. You find it extremely difficult to get along with other people. You find it extremely difficult to complete tasks within a reasonable time period. You experience at least three episodes per year where your symptoms get significantly worse. Each of these episodes lasts for at least two weeks at a time. Providing the proper medical documentation to prove these limitations is a crucial aspect of obtaining benefits. It is therefore important for sufferers to seek assistance from their medical team as well as their attorney. Mental illnesses can cause disabilities that are just as severe as physical conditions. Somatoform disorders are one such example. We can help you obtain the benefits you deserve. We encourage you to contact us today for a free consultation at 888-904-6847. What medical documentation will I need to obtain disability benefits for my somatoform disorder? People who suffer from pain and other physical symptoms with no identifiable cause are said to suffer from a somatoform disorder. Sadly, this condition often makes it very difficult to carry out activities of daily living, including working. Without the ability to work, victims often experience significant financial suffering. The Social Security Administration does recognize somatoform disorders as impairments that are eligible for disability benefits. Multiple physical symptoms that have lasted several years. To treat these symptoms, you must take medication frequently or be seen by a doctor regularly. The condition has significantly altered your life patterns. The symptoms of the condition began before you turned 30. You are suffering from an ongoing disturbance of vision, speech, hearing, use of an arm or leg, movement, or heightened or diminished sensations, and there is no physical cause. You are obsessed with thinking that you have a serious disease or injury. As a result, you are interpreting physical signs or sensations in an unrealistic or irrational manner. If you are able to produce this evidence, you may qualify for Social Security disability benefits. The application process may seem overwhelming and stressful for those who have not applied in the past. Fortunately, we can help. Hiring an attorney to represent you through this process can maximize your chances for obtaining the benefits you deserve. We encourage you to contact us today for a free consultation at 888-904-6847. I have polymyositis and am unable to work. 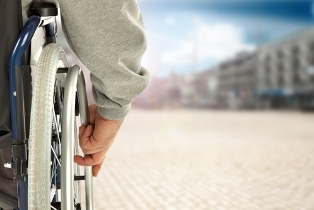 Will I qualify for disability benefits? Living with polymyositis is not an easy task. The condition is caused by chronic inflammation of the muscles in the body that weakens the skeletal muscles. These muscles control movement in the body, so the weakening can make it very difficult to carry out basic daily activities. In addition, the condition is progressive, meaning it will get worse over time. As a result, many victims find they are unable to work in order to support themselves. Review your medical record to determine how the polymyositis impacts your ability to carry out basic functions in the workplace. For example, the Social Security Administration will assess your ability to stand, walk, and carry or lift objects. The muscle weakness, muscle loss, calcium deposits, pain, fatigue, and shortness of breath associated with polymyositis can all have a significant impact on your physical abilities in the workplace. You may also find that the thickening of skin that often occurs on the fingers and hands make it difficult to carry out tasks that require fine motor skills, such as filing, typing, or placing small pieces together. Review your medical record to determine how the polymyositis impacts your mental functioning. Record your abilities and limitations on a Residual Functional Capacity form. Consider all of your limitations in conjunction with your job experience, education, and age in order to determine whether you are able to return to work. While benefits are crucial for many people, qualifying for disability benefits is often not a simple process. Fortunately, we are here to help walk you through the process. We encourage you to contact us today for a free consultation at 888-904-6847. What symptoms may qualify me for disability benefits for my polymyositis? For many people, a diagnosis of polymyositis can mean a future of chronic muscle weakening that gets worse as time goes on. As a result, you may find yourself able to do fewer and fewer of the necessary daily activities. This may include your ability to work in order to support yourself financially. The positive news, however, is that the Social Security Administration recognizes the condition as an impairment. Sufferers may be eligible for disability benefits as a result. Even though polymyositis is a recognized impairment by the Social Security Administration, qualifying for disability benefits is still not a simple process. Fortunately, we are here to provide valuable legal guidance. We encourage you to contact us today for a free consultation at 888-904-6847. Can I obtain disability benefits if I have scleroderma? If you are suffering from scleroderma, you may be experiencing a great deal of pain. It can be difficult for those living with this condition to carry out even the simplest of everyday tasks. This makes it challenging or impossible for scleroderma patients to work in order to support themselves. Fortunately, you may be eligible for Social Security disability benefits as a result of your condition. The type and number of symptoms that you experience typically varies depending on the severity of the disease and how far the condition has progressed. The more severe cases can impact the entire body. Unfortunately, there is no cure and no specific treatment for this condition. As a result, a person suffering from scleroderma may require disability benefits in order to obtain some relief from the financial burden imposed by this disease. Since qualifying for disability benefits is typically not a simple process, it is important to seek legal guidance. We encourage you to contact us today for a free consultation at 888-904-6847.